The smallest town in England is showing a big heart on Saturday 27th April to save its library. Local children will be dressing up as characters from their favourite books and making a lot of noise in a bid to save their much-loved library from closure. Manningtree Library is just one of the twenty-five libraries facing closure due to Essex County Council’s plans to save £2 Million pound. 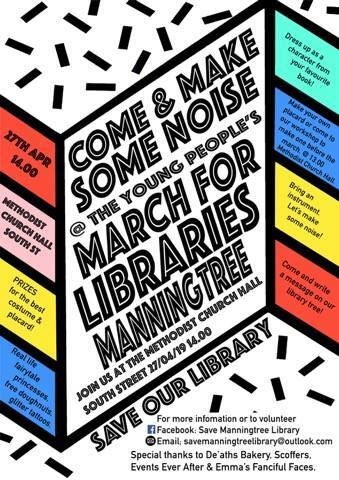 The Save Manningtree Library group which has been set up by local Mum and Labour candidate Holly Turner has arranged the march to begin at the Methodist Church Hall on South Street in Manningtree at 2 pm and will march to Manningtree Library, making as much noise as possible. There will also be a placard workshop from 1 pm in the Methodist Church Hall for children that need help making what could be their first ever protest placards. Holly felt enough was enough when she heard about the proposed Library closures she said “After having my second son, I was shocked at how much services for new mums have been stripped back since I had my first nearly five years ago. Rhyme time is literally the last thing standing it seems and now they want to get their hands on that and rip it away. My partner and I are both NHS nurses and have witnessed the decimation of public services and the library basically felt like the last straw for me. The event comes after a petition with 57,000 signatures was ignored by the Conservative-led council who are continuing to steamroll plans to close twenty-five libraries and reform the services offered by the forty-nine remaining libraries. Next articleThirty Years Since ‘The Truth’ but Are We Any Closer to Truth? Thirty Years Since ‘The Truth’ but Are We Any Closer to Truth?